Dynamic Surroundings is not involved in that call stack. If you post a link to your client log it may provide further clues. My next suggestion is to make unpredictable weather. The point is for the weather to change at random. Let's never know when the weather can change. The latest when the serene seasons mod is installed. That would be a function of another mod, or Serene Seasons. Since this alters the underlying mechanic of Minecraft Dynamic Surroundings will not do that. I have a question when I have serene seasons installed are the storms appearing, but rarely? Does it work like in reality? By default Serene Seasons follows the vanilla rain/thunder intervals. There are seasonal variations related to sub tropical biomes. These biomes have rainy/dry seasons, and during those seasons weather effects will not render for those biomes. Because it's about winter. Because in the winter and autumn, storms should appear rarely. Early autumn there should be storms because it's still close to summer. In the middle of autumn Thunderstorms appear rarely then. Early spring Thunderstorms will not appear right away either after the first day of winter. Thunderstorms are also rare then. In the middle of spring, storms can often appear. OpenGL: AMD Radeon R9 200 Series GL version 4.5.13492 Compatibility Profile Context 22.19.677.257, ATI Technologies Inc. It's not DS. If I were to make a guess I would say start with LabyMod based on the descriptions I read. This crash is occurring updating the display during a render pass. How do I disable the notification that alerts me of updates for the beta build? Under logging options. Set "Enable Online Version Check" to false. My game keeps crashing and I don't know why. 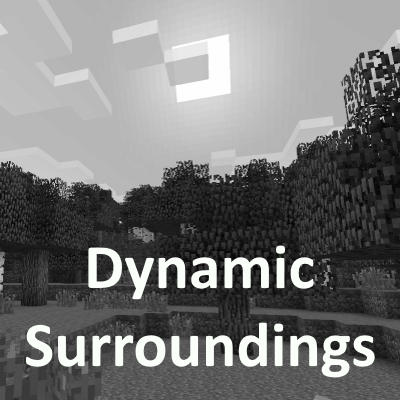 It says something about dynamic surroundings though. Hey, i loaded this mod onto my survival world annnnnndddd it erased my entire inventory :/ what type of mod does this? Not DS. It doesn't modify player inventory or JEI. Hi, I made an account to comment asking for help regarding this strange... particle.. cloud.. blob.. thing? that follows my everywhere at just below eye level. I've spent several hours trying to find what mod causes it, and I believe it's Dynamic Surroundings. This, I believe, is the frost breath effect if you are in a cold biome. If it get's sufficiently cold enough this effect will generate for you as well as other players and other mobs like witches and villagers. To disable set "Show Frost Breath" to false in the config. Hello! Fantastic mod you have here, I have one question though. Is there a way to edit when"Cave noises" start on the Y axis. I have a map I'm using that has areas under Y 60 which is a tad annoying hearing rocks falling when you're not in a cave. Thanks in advance!